I hadn't been creating anything worthwhile since 2 weeks as adjusting to the timings in my daughters new school hardly left any time for crafting or visiting blogs. I have been missing all my blogger pals! Craft challenges are sometimes just the thing to get you started when there is a lull in your creativity. 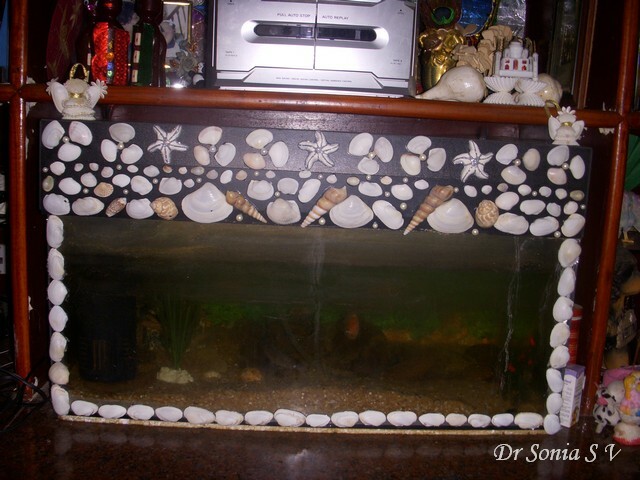 The sea themed challenge at BGC inspired me to alter our rather sorry looking fish tank using sea shells. Here is my daughter sticking the shells to the fish tank lid. We spend quite some time this Sunday making this father's day shell craft project! We made the pattern using the shells and then stuck them on using white glue[ fevicol].I also added some pearls to enhance the glamour of our shell craft flowers. 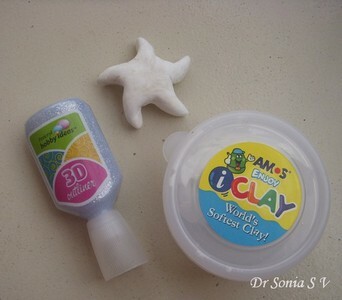 I made the star fish using Amos playdough and glitter-- getting the starfish arms just right did test my patience! I created a pattern of 2 shell flowers alternating with clay starfishes.Here is the completed lid of the altered fish tank with our shell craft. I still was not happy after I put on the lid despite the added beauty of the shells! So used my glue gun to add a border to the fish tank using more shells. 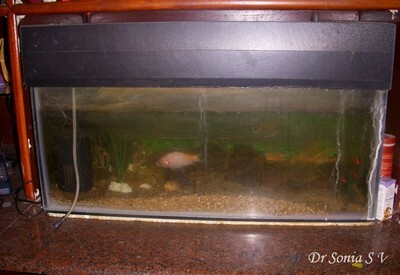 Finally I felt it hid some of the wear and tear of the old fish tank. My camera is not good enough to take good indoor photos but in reality the transformation of the old tank with the shells was amazing! I think my hubby's little gold fish agrees ! oooh all the sparkle on the shells looks awesome! great work Sonia! Yes Deepthi they are our favorites too! Your daughter has done a fantastic job! PS - Win delicious goodies! Easy to enter & open to everyone. You can link your entry to your blog if you want! Great way to spruce up the fish tank:) how fun! Have a fantastic day! you and your daughter are great team, very nice, it does look better with the shells going around the front of the tank to, awesome!!! Ooo !!! wow thats a cute one !!! Love the starfish ! thats a g8 fun project thanks for sharing with Beyond Grey challenges ! Great project! The old aquarium was really refreshed! WOW !its great to see such a project at the BGC !Thanks for joining in !! 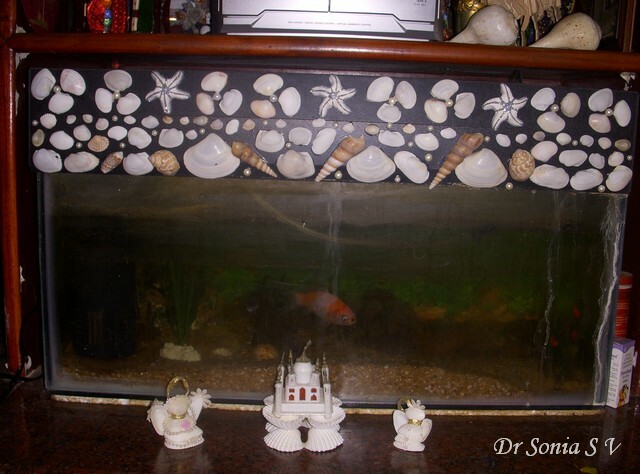 what a huge difference Sonia - just shows what a fab effect you can get with the shells - I hope the fish are appreciative lol! 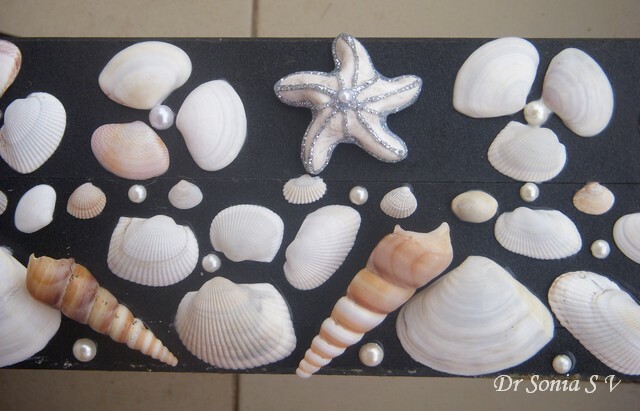 The pearls, shells, star fish, nicely arranged. beautiful Sonia. Great way to decorate a tank. Very creative. really very nice!......love the look of the aquarium....thats def. a happy goldfish! Great idea, Dr. Sonia. I think the fish is very happy with his home now. Ах, красота какая! Очень классно смотрится!!! Fish aquariums are alot of work. Looks like you decorated yours nicely with the shells. WoW... Its Superb dear... I loved it.. You changed it into super cool one.. keel a mermaid also into it, it will give more and more lively look to your awesome fish tank. I am new to here, but i loved your creations and following you. my creations are at http://riyakathir.blogspot.com if you like my creations, please hit follow in my blog too dear..
Riya Thank You for taking the time to encourage me.The link you gave is not working but I did land on another site of yours and its awesome ! Oh that is just lovely! I wish I could have an aquarium, but I don't have anywhere to put it! 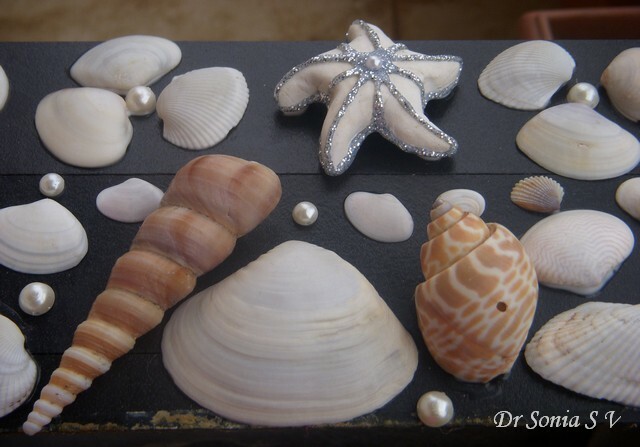 I do love shells and seastars so much.. great project, dear.. Such a fun project to do with the little ones. You daughter sure is enjoying. Such creativity, I love it! It really brightens up the fish tank. What a fantastic project. You did an amazing job, well you and your little helper!! Great project.Only you can come up with something like this.I am back at udhampur and can now do the guest post...if its okay with you. Waiting eagerly for your write up Snehal! What a fun project....that turned out so well! Hey Doc!! I have not been able to mail you or even reply to your comments on my blog. . Every time I try to mail you it says that i have been blocked. can u send me your alternative mail id.. I needed to ask you something. How pretty, Sonia. Hope you and yours are well. Listen, do you live in Bangalore? We used to live there in 1998 - infact we got married there. And my princess number one was born there. Hi Dr Sonia, I have been missing from blogland too and missed seeing your wonderful creations. This is such a transformation and those starfish are wonderful. oh what a great idea!! this looks fabulous...and fun!! 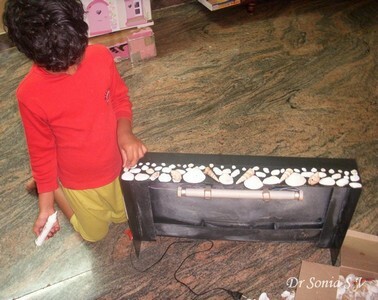 such an innovative post.. great use of sea shells !! 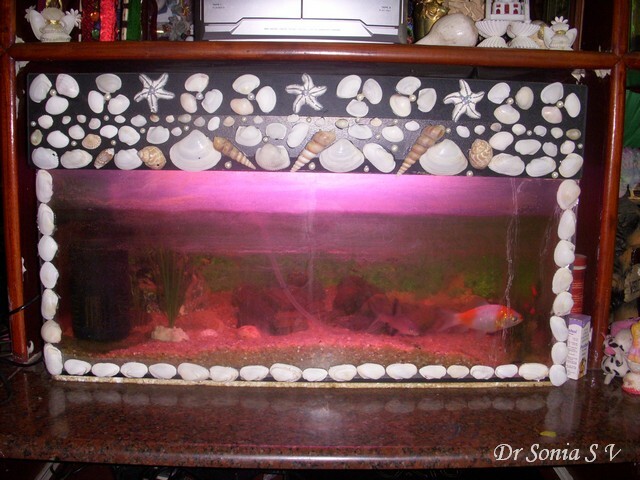 How fun is this love all the shells and the decoration of the fish tank. Very cool Idea!! Need to try this!! The transformation with all the shells looks stunning. You come up with such lovely simple ideas that leave others thinking why didn't we think of that!!! hugs Mrs A.
Sonia, It's been awhile since my last visit here! I have so many new projects of yours to enjoy! The fish tank looks beautiful! You have an amazing blog Dr. Sonia and for a beginner like me I think I require a year atleast to learn all these from you. Thanks so much for showing us how crafting can be so passionate. Gosh.. thats a fair bit of hard work.. doc.. :) But it looks gorgeous.. how have you been?? What a fun project! Thank you for sharing this at Rustic Restorations Weekend!